The biological processes of most living beings are governed by the so-called circadian clock, a kind of natural timepiece that adjusts internal vital rhythms to external environmental rhythms, regulating cellular metabolic activity according to cycles of light and dark. Synchronized with a 24-hour time period, this clock is what causes a person to feel sleepy at night, remain awake during the day or feel jet lag when traveling across time zones. Although the workings of the circadian clock in complex, multicellular organisms has been the object of research for a long time, studies on the biological rhythms of microorganisms are rather recent. 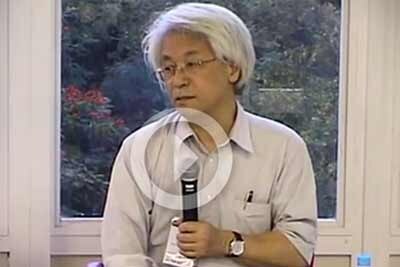 In a conference at the Intercontinental Academia (ICA) addressing the main theme “Time,” on April 22, Takao Kondo spoke about the progress he has achieved in this field with experiments involving prokaryotes – unicellular organisms lacking some organelles and a nuclear membrane. 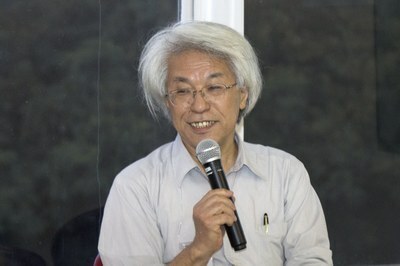 Kondo is professor of Biological Sciences at the University of Nagoya (Japan) and member of the Scientific Committee of the Institute for Advanced Research (IAR) at the ICA. He is known for having been the first scientist to reconstitute a circadian clock in vitro, laying the foundation for numerous discoveries on the molecular basis of biological rhythms. Kondo’s great headway was to identify a group of genes – known as kaiABC – that controls the Synechococcus’ circadian clock. He explained that the phosphorylation and dephosphorylation cycles of the protein encoded by the trio of Kai genes – KaiA, KaiB and KaiC – act as regulators of the biochemical mechanism that times the daily rhythms of cyanobacteria. Phosphorylation is the metabolic process of adding a phosphate group, donated by an ATP (a molecule that stores energy), to a protein. Dephosphorylation, in turn, is the removal of a phosphate group. The dynamic addition and removal of phosphate, catalyzed by the kinase and phosphatase enzymes, inhibits or activates the expression of a gene, i.e., its encoding in a protein. That is why it is one of the main mechanisms for regulating proteins. The discovery of the role of the Kai genes in the metabolism of Synechococcus cleared the way for the in vitro reconstitution of the circadian clock of cyanobacteria. Toward this end, Kondo mixed the trio of Kai proteins with an ATP molecule in a test tube. The incubation confirmed the hypothesis that, in the presence of these four elements, the 24-hour cycles of cyanobacteria occur autonomously, even in the absence of external “time cues,” such as the alternation of light and dark. According to Kondo, the circadian rhythms generated by the oscillation of KaiC act as a molecular timer that regulates the entire metabolism of cyanobacteria. He said that the oscillation between the phosphorylation cycle of KaiC and the gene expression of KaiA and KaiB resembles the mechanism of the pendulum: as the escapement transmits timekeeping to the clock’s hands, the pulses generated by Kai proteins transmit temporal signals to the cell, performing the fine adjustment of vital processes that depend on synchronization with external factors. He also drew attention to the accuracy of the biological rhythms of cyanobacteria. “Nature imitates art. The circadian clock of the Kai protein seems to have been designed by a master watchmaker,” he concluded.